Leon Altman has 30 years of experience as a copywriter, creative director, marketing director and editor. He has been a copywriter and creative director at premier agencies, such as Y&R, BBDO, Wunderman, DDB/Needham, and Saatchi, and won top advertising awards including Beldings and Clios. Leon has created a wide variety of highly successful marketing and communications campaigns for companies such as Citicorp, IBM, Apple, Barclays, Ameriprise Financial, Coldwell Banker, Autodesk, Johnson&Johnson, McKesson, Novartis and Glaxco Smith Kline, as well as for hundreds of small and medium size businsses. He was also the founding marcom director and writer for Buyside magazine (a publication for institutional investors). Since 1996 Leon has been extensively involved in content development and direct response/conversion for Internet companies. He was creative director of theStreet.com, PR consultant for quote.com, and one of the lead writers/editors on the giant launch of iShares- including its first website. Based on his long experience he has gathered and codified the principles of sticky content- content that sticks, stands and spreads. And with his unique background in both content and direct response he has created coaching and consulting programs to help entrepreneurs and companies connect the dots between content and conversion. He brings his unique and extensive experience in both content development and direct response to provide entrepreneurs and companies with coaching, consulting and services to help them connect the dots between content and conversion. He has helped hundreds of small to medium size businesses to attract and retain new customers with both content and high conversion sales copy. He is also a content and marketing advisor for Wandering Educators, a top travel blog. 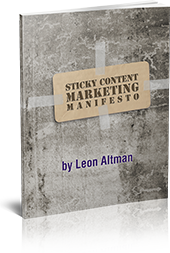 With Sticky Content Marketing Leon has put together all his best content resources and his years of writing and editing experience to offer companies a cost-effective way to take advantage of content marketing as a key driver to attract and retain clients.